Darth Vader finds your lack of holiday cheer disturbing. Appease him with these festive Imperial designs. Breaking out the holiday decorations can be a real source of frustration. Between untangling coils of lights, drowning a living room in a sea of pine needles, and dodging inflatable giants on a front lawn, it's a holiday miracle in its own right that anyone has the patience to do this year after year. At least making paper snowflakes is still fun. Even if you're not artistically inclined, all it takes to make these holiday decorations is a sheet of paper, some scissors, and a level of skill in folding best described as "miniscule." 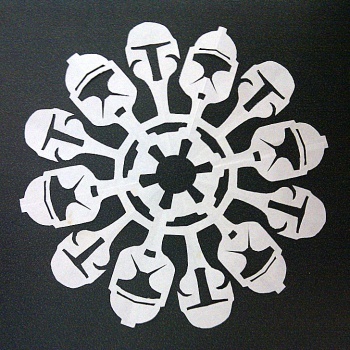 A group of enterprising Star Wars fans has found a way to make paper snowflakes even more fun by giving the cutouts an interstellar flair. Better still, the designs are available online for any would-be Stormtrooper with a few minutes on his hands. The snowflakes come from a husband-and-wife team who stumbled on them almost completely by accident. While the wife made snowflakes with her son one day, she noticed that one of his designs had come out looking very close to the face of a Stormtrooper. Deciding that she could use the same basic principles to create a variety of characters, she set to work perfecting her son's formula. Shortly afterwards, her husband posted up her two designs online: a Clone Trooper/Boba Fett and Darth Vader. Since then, other industrious Star Wars fans have added designs for Admiral Ackbar, R2-D2, Stormtroopers, and more. The construction of the four snowflakes looks fairly simple, and many of the character designs share similarities. The design documents are available freely online, so why not take a look? This year, instead of yawning at another ho-hum snowflake, you could make your guests kneel in servitude to the Dark Lord of the Sith - or fall into a Sarlacc Pit, whichever seems most convenient.